The Infosys Prize for Humanities — History has been awarded to UCLA Professor Sanjay Subrahmanyam for his path-breaking contribution to history. 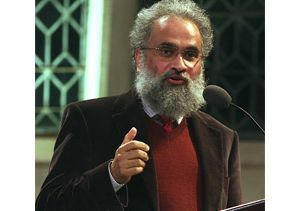 Subrahmanyam, a distinguished professor of history, the Doshi Chair in Indian History and the founding director of the Center for India and South Asia, was lauded by the Infosys Science Foundation for being "an outstanding scholar of early-modern (1500-1800) South Asian history. He has been able to develop a new genre of ‘connected history,’ involving persons, products, and social and political processes stretching from Melaka in the East to Portugal in the West." The Infosys Prize, awarded by the foundation, endeavors to elevate the prestige of scientific research in India and inspire young Indians to choose a vocation in scientific research. The award celebrates success in scientific research and excellence in these fields: engineering and computer science, humanities, life sciences, mathematical sciences, physical sciences and social sciences. Winners receive a medallion of pure gold, a citation and a purse of $90,000 per category. This is the first time that a prize in the humanities category was awarded. Subrahmanyam and Amit Chaudhuri, professor of contemporary literature, University of East Anglia, UK, were awarded the prize in the new humanities category in the fields of history and literary studies respectively.